The Queen has visited the Duke of Edinburgh in hospital in Cambridgeshire, where he has been treated for a blocked coronary artery. The duke, 90, had a coronary stent fitted after he was taken to hospital suffering chest pains. 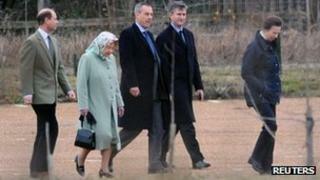 He is in "good spirits" but remains under observation at Papworth Hospital, Buckingham Palace said. The Queen was accompanied on the 45-minute visit by their sons Edward and Andrew, and daughter, Anne. They arrived by helicopter for the visit, where they were met by the hospital's chief executive and Professor John Cunningham, chief physician to the Queen. After they left, the Prince of Wales and the Duchess of Cornwall arrived by car from Highgrove. BBC royal correspondent Nicholas Witchell said the fact the Queen had visited her husband so promptly suggested it was a "moment of real anxiety" for the Royal Family, albeit one which appeared to have passed. But the duke's grandchildren will not be visiting the hospital on Saturday. Speaking outside the hospital, Buckingham Palace spokeswoman Ailsa Anderson said: "The Duke of Edinburgh had a good night and is in good spirits but he is eager to leave. "Sunday's church service is going ahead as planned and we don't anticipate changes to the Royal Family's Christmas celebrations." The duke is not expected to attend that Christmas Day church service at Sandringham. The "minimally invasive" coronary stenting procedure he underwent involves pushing a balloon into the artery and inflating it to remove the blockage. Prince Philip would have remained conscious during the procedure. He was flown to the hospital by an RAF helicopter. No other member of the Royal Family travelled with him. Royals usually don't rush to the hospital bedside of one of their own. Senior members like Prince Philip don't like the fuss and they know the problems their presence can cause a busy hospital. When he was last unwell in 2008, no family member visited him during his recuperation. Three years on, and six Windsors -- including his wife and his four children -- have been by his side with some alacrity. Granted, they were all poised to be under the same roof, at the same time, for once. But the visits also suggest Philip's sudden ill health has been a cause for concern and worry. The Queen and her children are likely to be relieved that so far, the prince appears to be on the road to recovery. True to form, the nonagenarian is apparently "eager to leave". His doctors, and possibly his wife, are being cautious. Senior members of the Royal Family, including the Prince of Wales and the Duke and Duchess of Cambridge, had been due to arrive at Sandringham on Saturday for Christmas. The family traditionally travel to St Mary Magdalene Church on the royal estate for a service on Christmas Day, while the duke was due to be leading Sandringham's Boxing Day shoot. Prince Philip, who arrived at Sandringham on Monday, is the longest-serving royal consort and celebrated 64 years of marriage to the Queen in November. He was last in hospital in April 2008, when he spent three days in London with a chest infection. On that occasion, the Queen did not visit him. In October this year he pulled out of travelling to Assisi in Italy because he had a cold - he had just returned from an 11-day tour of Australia with the Queen. Speaking ahead of his 90th birthday, in June, the duke said he wanted to slow down. He stepped down as president or patron of more than a dozen organisations. Royal biographer Penny Junor said the duke was generally in good health for his age. "He is an extraordinarily fit man. He takes a lot of exercise, he does an awful lot of work. He's in very good shape generally. So with luck this is a blip and he'll be back fighting fit and back with the family for Christmas." A Downing Street spokesman said: "The prime minister has been kept informed of the situation and wishes the Duke of Edinburgh a very speedy recovery." Meanwhile, the Queen's Christmas Day broadcast to the nation will highlight the importance of the family unit. The speech, taped on 9 December, reflects on a year in which her grandson Prince William got married and her husband turned 90.